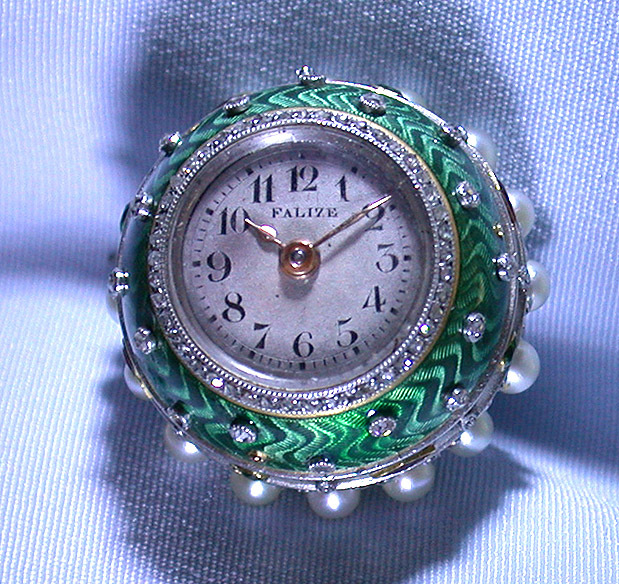 Fine, rare and very unusual platinum, 18K yellow gold, diamond, pearl, ruby and emerald crown form bezel wind ball watch with matching crown pin by Falize, Paris, circa 1880. The body in green enamel (some restoration) over engine turning. Silver dial with black numerals and gold hands within diamond set bezel. 11 jewel lever movement. 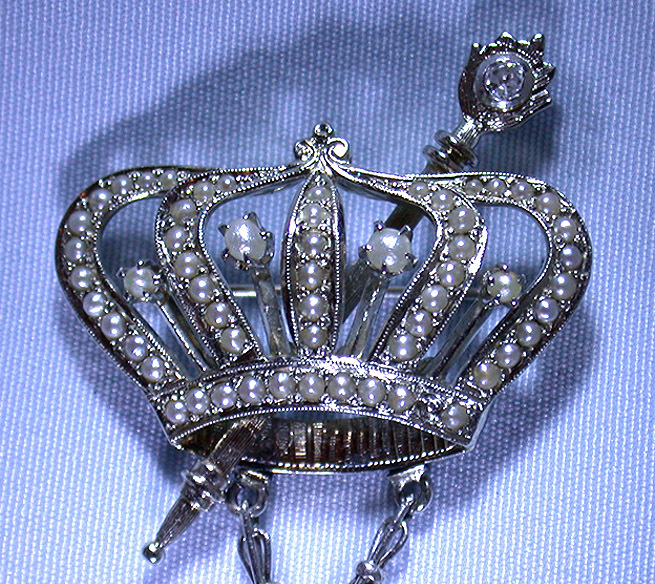 Suspended from a matching pearl set crown pin. Spectacular. Falize, the Parisian jewelers and goldsmiths, was established in 1838 by Alexis Falize (1811-1898), who supplied famous retailers including Mellerio, Boucheron and Tiffany as an anonymous designer . 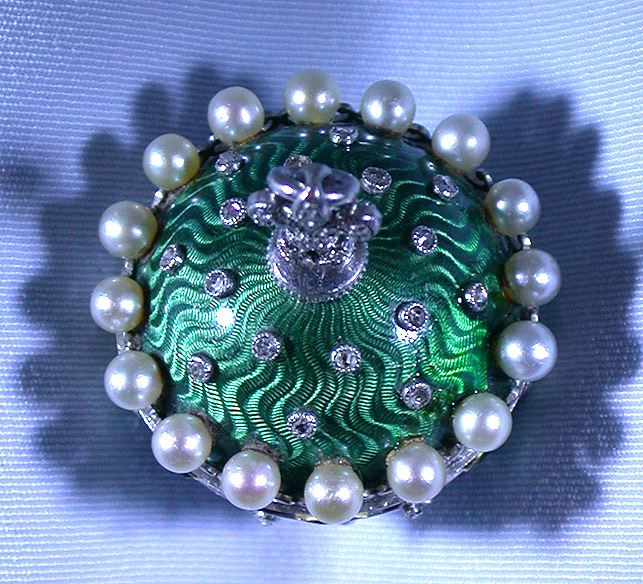 The first pieces offered under his own name were cloisonnÃ© enameled jewelry. The Victoria and Albert Museum acquired examples of these works in 1867. His son Lucien (1839-1897) received his training (1856-71) in his father's firm. In 1876 Lucien opened a shop on the Avenue de l'OpÃ©ra and achieved an international reputation with his displays at the 1878 and 1889 Expositions Universelles. 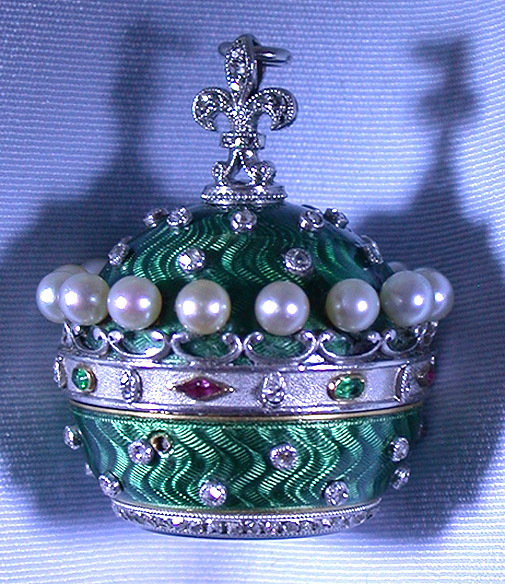 Lucien Falize made extensive use of Renaissance traditions as well as different enameling techniques in his designs which are notable for the clarity and vividness of enameling and contrast between color and texture.